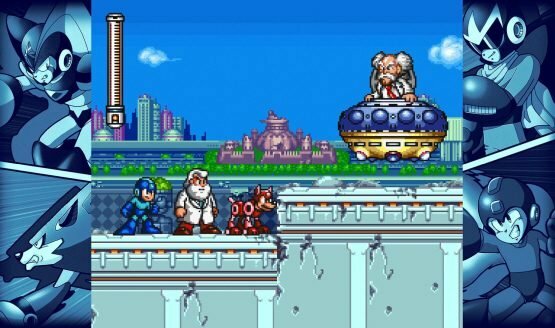 Digital Eclipse’s Mega Man Legacy Collection was a perfect example of a nostalgia trip done correctly. The compilation of NES-era Mega Man titles featured gameplay that was identical to the original, but also added new functionality (such as save states) that made the games accessible to a whole new generation of video game enthusiasts. Throw in an incredible collection of art assets, including biographies of every villain in the games, and it was a fan’s delight. The only disappointing part of the collection was that it only contained the 8-bit journeys of the Blue Bomber. This meant that a number of classic titles were nowhere to be found. That’s where Mega Man Legacy Collection 2 comes in. This time developed by Capcom Japan, the follow-up compilation includes the four most recent outings in the main series while also adding in new features such as being able to play with extra armor. Since I decided to check out the games in chronological order, I was initially greeted with Mega Man 7‘s drawn out opening. Sadly, no option to skip the opening was added, so players will have to sit through several minutes of dialogue before starting the only SNES game on the disc (I miss you, Mega Man Soccer). It appears to be a faithful port, as the classic game played as I expected it to, but I’d have to spend more time with it to directly compare it to Digital Eclipse’s ports of the first six games. Mega Man 8 was the Blue Bomber’s first PlayStation title, and I’ve never held much of an affinity for it. I quickly checked to see if the original voice acting returned, and I can confirm it’s just as atrocious as it was in 1996. This extremely underwhelming platformer adds practically nothing to the established formula, but I was glad to see it included for archival purposes. Finally, the collection includes the two most recent titles: Mega Man 9 and 10. Despite being released for the PlayStation 3, these titles play nearly identical to the NES games found in the first collection. As such, I had the most fun checking these two titles (although Splash Woman still has my number). All of the DLC for the two games are included, which means players can take on Fake Man in 9, and the Mega Man Killers in 10. The final thing I got to check out was the challenge mode, which operates similarly to the first game. Comprised of stage remixes and timed segments, this mode allows players to really put their skills to the test. Online leaderboards return, so the most dedicated fans can challenge each other for Mega Man supremacy. One of my favorite parts of the original Legacy Collection was the incredibly detailed mueseum, which offered up previously untranslated backstory for Mega Man’s enemies. While this feature returns in the sequel, it was sadly locked during the demo. Capcom describes it as “an archive of production art, sketches, development materials, concepts, and more.” So, hopefully it’ll be up to the same quality as the last game. Despite the change in developers, Mega Man Legacy Collection 2 looks to be yet another solid retro offering from Capcom. It’s not as an attractive of a package, but that’s simply due to the games that are offered here. It definitely spotlights how few core adventures the Blue Bomber has gone on, and hopefully that’ll change sooner rather than later. If not, I guess we’ll always have Mighty No. 9. Mega Man Legacy Collection 2 is set to release August 8, 2017 for PlayStation 4, Xbox One and PC. Previewed on PS4.